CAMAS — Do you love art and dream of having an art collection? Starting one will be easy at the “Little Art Camas’’ event in Downtown Camas. benefit downtown public art efforts. Tickets to the event are $5 at the door and good for both Friday and Saturday. Children under 12 are free. Each art piece is priced at $20. 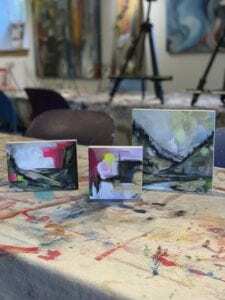 Art sizes include 5×5, 5×7 and 8×8. The event will be hosted in the remodeled Fuel Medical Building lobby in Downtown Camas, 314 NE Birch. The event on Friday, 5-9 p.m., will have live music, appetizers and wine, prizes and art demos to add to the fun. The event continues on Saturday, noon-5 p.m., with an “Art Refresh” of many new art pieces added to the exhibition. Purchased art will be picked up after the exhibit on Saturday or also on Sunday so that all art can be enjoyed both days. See details in the Event Schedule below. 6-9 p.m. Exhibit Browsing and Buying Starts: Buyer’s Buttons are stickers with your Buyer Number on them. Use these to mark your chosen treasures by replacing the Artwork Number sticker with your Buyer Button. That signals other browsers that this work is taken. Return to the registration desk to pay for the number of Buyer Buttons you used. Noon-5 p.m. Exhibit Browsing and Buying: Many new artworks will be added to the exhibit that were not displayed on Friday. 5-6 p.m. Art Pick up (continues on Sunday): Both buyers and artists of unsold works can pick up their artwork during this time. Noon-2 p.m. Art Pick up continues: Please pick up purchases and/or unsold works by the 2 PM deadline. If unable to make these times, please send a friend.